Unlike bulldozers or sprays, goat grazing is an ecologically beneficial way to clear unwanted weeds or brush and promote the growth of native grasses. And when the goats are finished, they don’t chew up the land or leave behind synthetic chemicals that run into rivers or streams—or into your drinking water. For years, chemicals have been considered the best solution to noxious weeds. But times are changing as more and more people are looking for sustainable ways to do business. Let’s face it, chemicals have been around for decades and we still have the same problems that we did back when they started concocting those miracle herbicides. It’s time to try something new. We Rent Goats® doesn’t claim that we can eradicate all your noxious weeds in one grazing. A common approach is to bring the goats in each year for 3-5 years, with the landowner managing the land after the goats leave each year. It may take a few seasons to get your weeds fully under control. 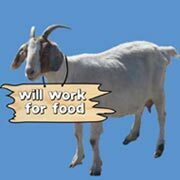 But by eating the weeds and the seeds, goats can significantly diminish your noxious weed problem. We know from experience that goats are the most economical, the most sustainable solution for people who want to restore weed-infested acres to their previous glory and protect property from fires. Natural weed control is part of our national heritage. We’re proud to be able to offer it to you. Have more questions about the goats? J. Johnson and R. Wells, “Goats and Weed Control,” The Samuel Roberts Noble Foundation, October 2007. Available at http://www.noble.org/ag/soils/goats/. K.C. Harrington et al, “Recovery and viability of seed ingested by goats,” New Zealand Plant Protection Society, 2011. Available online at http://www.cabi.org/isc/FullTextPDF/2011/20113406633.pdf. Are there any weeds a goat won’t eat? Goats aren’t real picky. But there are a few things goats just don’t go for, like cactus, tumble weed (once it has thorns), stinging nettle, and foxtails (once they grow those microscopic barbs dog owners know all about). In our experience, these are about the only plants goats won’t eat. For a list of the weeds our goats will eat, see “What’s on the Menu.” One of the reasons we like to come visit your property beforehand is to see what kinds of weeds you have. As long as the weeds you have are weeds are goats like to graze on, we’re good to go.